Each week the Capital Theater’s “Presentations” are growing in popularity and Manager McLaren’s latest in entertainment is finding a ready welcome at the hands of Capitol patrons. Delano Dell, who has become a regular fixture at the Capitol as a sort of “Master of Ceremonies,” has developed a large following during his short stay in Jackson and this week will offer some brand new comedy Songs and dances in addition to his usual comedy chatter. “Clem” and his Merry Gang will play a couple of red hot jazzy selections of the “Gang” will be assisted by that scintillating beauty, Donna Darling, and her “Little Jewel Revue.” Miss Darling who has appeared at the Capitol before is known as one of the most beautiful girls in vaudeville today and her assisting artists are also eye easy. They will offer a combination of singing, dancing and comedy numbers with elaborate costumes and the whole presentation will be given in a very attractive stage setting. Then there were two clippings showing the programs. The first one showed her Program running Sunday through Wednesday, March 7th through the 10th. Only 1920 and 1926 included Sunday, March 7th. The cartoon, “Felix Baffled by Banjos,” was released in 1924,[v] which dated the event as not 1920. Additionally, another clipping indicated Donna playing the 4th, 5th, and 6th with the same type and layout of the program. The second clipping show some of the same people playing and some new items. Additionally, the film “Cupid a la Carte” was released in January 1926[vi] further fixing the date of this show as 1926. Finally, on the same page as the clippings regarding the Capitol Theater, there was a photo of Donna. 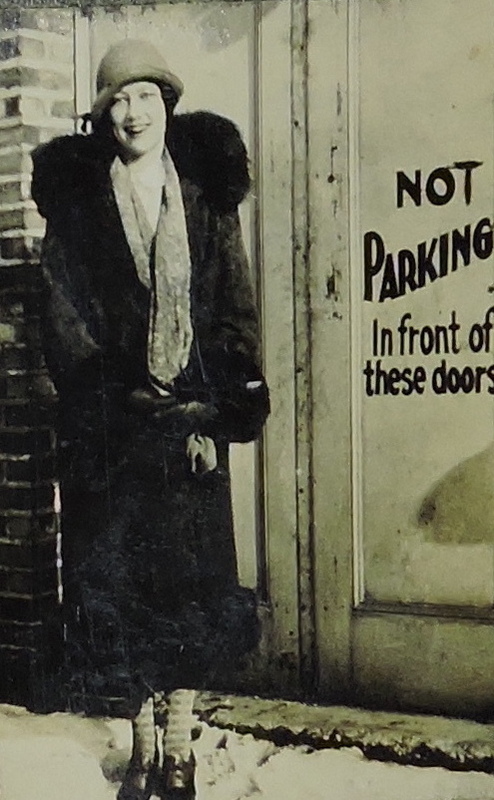 From its appearance, I think it is probably taken at the back door to the theater in March 1926. Donna is wearing a fur coat and there is snow on the ground. The venue is the Capital Theater in Lansing, Michigan. The date is March 4-10, 1926. It is not clear from the March 4th, 5th, and 6th, ad if Cecile Forbes, Dorothy Clyne, and Jane Sadler were part of Donna Darling’s “Little Jewel Review” or not. Added: March 4-10, 1926 – Donna Darling and “Little Jewel Review” played at the Capital Theater in Lansing, Michigan. [i] Donna Darling Collection – Image 1420. [iv] I have cropped, edited, and sized the clippings for the web.